“I can’t really see the heartbeat,” my husband said, looking at the imaging screen during an ultrasound of our nine week old baby. “Well it’s early, so maybe we can’t see it on the tummy. With the transvaginal you’ll be able to see it better. Right?” I looked hopefully at the sonographer who didn’t seem to have any words to give me. Working for an ultrasound training company and being present for those trainings, gave me just enough knowledge to be dangerous to any sonographer. I knew just enough to get myself in trouble. “Why don’t you go get undressed, and let’s take a look,” she said. And I slipped off the table and rushed to change clothes in the small bathroom. While changing, I began to realize that something may not be right. I’d come in thinking we would date the pregnancy, I’d leave with pictures to show our young son, and I’d have a healthy pregnancy to enjoy for several more months. I didn’t come prepared for bad news. I didn’t come prepared to say good bye. I stepped out of the bathroom in my hospital gown and slid back on to the table. The sonographer moved the ultrasound machine down towards her and away from me, so that I could no longer see what was going on. I wasn’t allowed to view the images she was taking, and she had no interest in answering my questions with truthful answers. “Do you see a heartbeat?” I asked. You’re not sure? Then why in the world are you scanning me? I know how to identify a heartbeat on the ultrasound screen, and I’m not even a sonographer. I, of course, didn’t say any of those things. I simply laid there, praying and pleading with God for the life of my baby. Finally, she told me I could get up. I asked what was wrong, and she said the doctor would be in to see me. No answers. No acknowledgement. But I knew something was wrong, and I was angry that my medical records—my body—my rights had been taken from me. What if there was no next time? I wasn’t guaranteed to have another baby. I left that day and felt as if my loss was something trivial. The life within me wasn’t anything special to the radiologist or the sonographer. Their own nerves and discomfort prevailed over my grief and heartbreak. My sonographer could have been more life affirming. When I asked about the heartbeat, she could have said that she wasn’t seeing one. She wasn’t seeing what she would expect to see at nine weeks pregnant. She could have allowed me to see the screen, so that I could see for myself that there was no heartbeat. As it was, I only had her word to go on. The radiologist could have been more life affirming by acknowledging my loss. “I’m so sorry for your loss” goes a long way. I didn’t need the promise of baby pictures next time. Having another baby wouldn’t replace the one I’d lost. As it turned out, I would go on to lose five more babies in the coming years, and I had good experiences and bad with those performing the ultrasounds. Some experiences were life affirming. My loss was acknowledged. The hurt and compassion in the sonographer’s face was evident. She/he felt my pain. Knew this baby was irreplaceable. Valuable. The bad experiences continue to stand out, though. Being told “Well, at least you look pretty,” after discovering you’d just lost another baby, was astonishing. A sonographer’s nervousness is not an excuse for diminishing the life of a child, whether wanted or unwanted. Life is important. It’s cherished. And words that are said that make it seem trivial, fleeting, and unimportant have no place in an imaging room. There are always ways to be life affirming. Choose those words that show compassion. Choose those actions that show support. 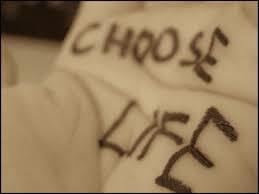 Choose life…always.